It was perfect that Rangana Herath's parents bought the family their first television shortly before Aravinda de Silva's 1984 debut, because soon de Silva was Herath's favourite player. 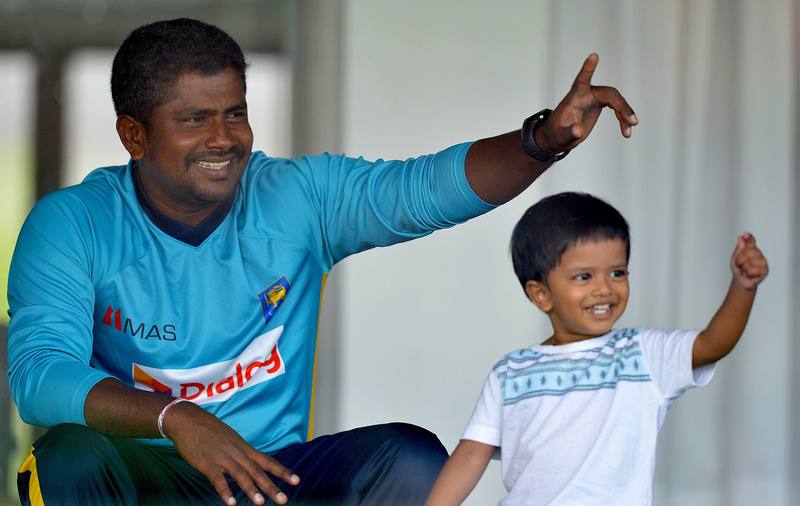 "When Aravinda is smashing sixes and fours," Herath remembers, "who doesn't want to watch?" There was sometimes a crowd in the house. In the lush village of Waduwawa, on the southeastern tip of the Northwestern Province, this was one of the first black-and-white television sets. Matches drew friends and neighbours to the lime-green living room, and when games finished, the mob scattered into the front yard. Beneath thambili palms, with birdsong in the trees, and the Buddhist temple's bana on the breeze, they poured out pent-up aspirations into matches of their own. When no friends were around, older brother Deepthi was cajoled into games. "Aiyo I could never get away from him," Deepthi says. "He was always wanting to play. I had to learn batting left-handed even, so that I wasn't breaking windows when I hit to the leg side. He batted left-handed from the small days, so he was always whacking balls into the trees. If I couldn't play, he'd hang a ball in a sock from the mango tree, and hit it by himself. He had more than enough shots." It was partly on the strength of these shots that Herath was recruited to Kurunegala's Maliyadeva College. Sometimes he opened the batting for his school's age-group teams. He even bowled fast until the coach told him he wasn't tall enough. His mother, who worked at the provincial council in town, would take his lunch to the matches: rice and curry, sometimes with his favourite fried okra. If Herath missed the 8:30pm bus into the village after games or training, Deepthi would pick him up on his motorbike. 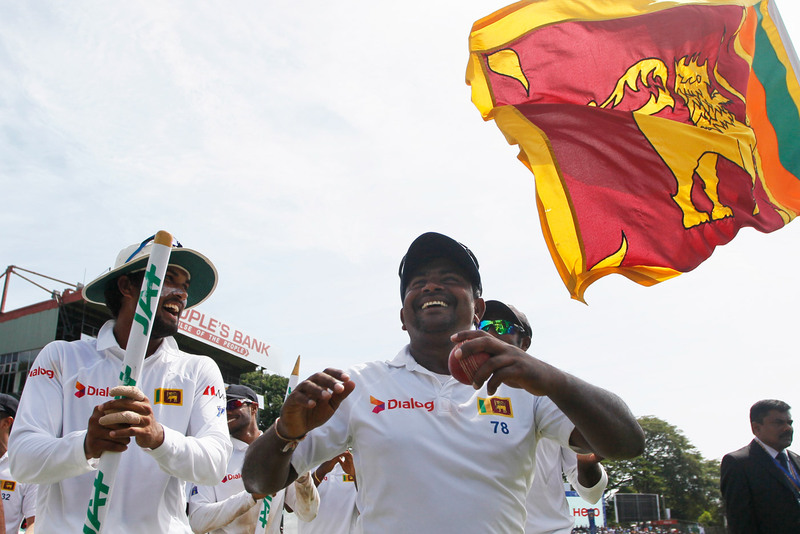 Years later Herath's shots helped him get a trial with a first-class club in Colombo. "I think he was with Colts at that time," says Chandika Hathurusingha, the former Sri Lanka allrounder, and current Bangladesh head coach. "But he wasn't getting matches - not even with their Under-23 team. Luckily he happened to be working with my brother Chaminda - in a shipping line, I think. Around the same time I moved to Moors, which had just been promoted to the Premier level, and as the captain, I was looking to build a team. "One day my brother told me: 'Aiya, you have to see, there is this fellow in my office who bats like Sanath Jayasuriya and bowls as well.' You know, this was the time Sanath was scoring so many runs. I said: 'If he can bat half the way like Sanath, ask him to come.' So two days later Ranga came for practice. When he bowled in the nets I thought he was a good bowler - I was actually quite impressed. "But I have to say, that was the last time I ever listened to my brother when it came to batting." On a breezy July afternoon in Colombo, Herath and two other men are stood in the shade of a tree whose future they are contemplating. The issue is worth careful thought, because of all the island's victims of urban sprawl, little is mourned in Sri Lanka like the felling of a tree bearing jackfruit. It is the crop that gives and gives. In the early season, the jackfruit's hard, green flesh is pickled, or cooked in a sour polos curry. Fruit harvested later is carved up, shared with neighbours, and poached into creamy kiri kos. For dessert, the jackfruit lends its sweet, fleshy seed casings (or aril). And though by this stage most have had enough, the seeds themselves may then be dried and mixed up in a mellum, or made into a curry of their own. This tree stands just beyond the walls of Herath's own family home, east of Colombo, where the city's fringe melds with the countryside. At the top of the road, rowdy rows of buses, vans and three-wheelers roar along. From the bottom of the hill, a little way down from the Heraths' house, verdant fields of paddy are glimpsed. The family's driveway is paved and the garage's roller door shut, but sometime during the afternoon, a rat snake squeezes through a grate, then quickly slithers out again. "Well, I will probably have to remove some branches on that side," the shorter of Herath's companions says, pointing at the canopy. He is the owner of the vacant plot adjoining Herath's, and it is on his land that the tree grows. "But that is all I will do," he hastens to add. "The rest, of course, I will never cut." The tree's safety assured, the men may take a relieved breath and move on to neighbourly chit-chat. Plans for home improvement are discussed. The uneven road is lamented. Space for a badminton court is mentally plotted out, though it may never come to fruition. Soon, inevitably, cricket comes up. "So malli, what is this I hear about you retiring from one-dayers?" the neighbour asks. "You could have easily kept playing, no?" As he says this, the other man - the neighbour's friend - nods along. Both fellows are probably nearing 50, but show no white hairs, and are fairly lean. Herath is the shortest of the three, wears a polo shirt that clings to his belly, has a light dusting of grey at his temples, and as for his chest… let us be kind and say it is generous. If a stranger were to pick the elite sportsman from among them, Herath would be the dead-last choice. "I really do think you did a foolish thing retiring, ah." The neighbour has now worked himself up to a small rant. "How many wickets were you still getting? Everyone knows you were still bowling really well. If you have problems with your knees, why not give up Test cricket and keep on playing T20s? Four overs - that would have been very, very easy for you. You could have played for a few more years." It eventually comes to Herath to respond, and he does so with a single smiling sentence: "If they have stopped picking me for one-dayers and T20s, it must be for a reason, no?" The neighbour remains unconvinced and indignant, but Herath is still smiling when he leaves the men and re-enters his own home. He is still grinning when he settles into a chaise couch in his large living room lit by a skylight, and thinks over what was said. "What that aiya was talking about - it's all harmless," he says, the gurgle from a small indoor pond accompanying his lilting Sinhala. "I hear these things all the time. Everybody is very free with their feedback. That's the thing about being a Sri Lankan cricketer." Unsolicited advice flies at Herath from all directions: from long-time friends, from team hangers-on, from reporters, from coaches, from supermarket strangers. Where in others this might inspire indignation - maybe even disdain - it draws from Herath a chuckle. "Sri Lankan fans are the best in the world, I think. Look, they will talk, but they will let you live your life. When you play well they will support you. When you lose, there are no big problems. You can live a normal life. If I'm home, I do everything. I don't send anyone on errands. I don't even have anyone I could send on errands." In the one-car garage is a mid-level SUV, a Kia Sorento, in which he ferries his two little boys to kindergarten, or makes trips to the bank, or the market, or weddings in Waduwawa. He is almost infuriatingly chipper about much of his life, and most of his career. It would be easy to look at his record - to make note of the 296 wickets since 2009 - and think this is a man who should feel cheated at being overlooked for a stable place in Tests until he was 31. Herath, though, is not an "It would have been so much better if…" sort of person. He is an "I am lucky that…" kind of guy. Years in a domestic system as poorly paid as Sri Lanka's, for example, feels for some like rambling in the wilderness. Herath, though, is grateful for the coaches like Hathurusingha, who continued to encourage him, and the job at Sampath Bank that kept the lights on. For the record, he has never been a clerk: he used to work a nine-to-five at the card centre during the domestic off-season, and played for the bank's mercantile team in partial exchange for employment. Lately he has been a sort of ambassador, luring big-money accounts. "You always remember the people who helped you when times are tough, isn't it?" he says. "For me, the bank was like that." Where others might snipe at selectors who have told them they are "too short for Test cricket", Herath remembers the matches he did get to play; the tours that were thrown his way. "It's not like I was completely ignored those days," he says. "I went on an overseas Sri Lanka U-17 tour when I was still at Maliyadeva. Then when I started playing Tests, there were probably a few games where I didn't perform that well. "Still, I always thought I'd get a proper run at Test cricket, because they kept picking me in the Sri Lanka A team. That's something worth mentioning also, no? It is also a big thing." It makes sense this is the way Herath is wired. It fits that a serial optimism has been hardcoded within. Because how else could a man of his workaday method have become one of his nation's greatest match-winners? Who else could have imagined the five-wicket hauls against each one of his opponents, or the fightbacks, or the hat-trick, or the many collapses sparked and games settled? Maybe no one else but him. When Herath's fingers twitch, and the ball flits between hands at the top of his mark, he is a grainy, flickering, black-and-white marvel. Watch him. His legs begin to move like the wheels of an old steam train. There's an amble, then a shuffle, then a delicate jog. He gets side on, and the belly turns towards the batsman like a planet rotating to face the sun. The ball leaves the hand, and oh, its tilted seam is in perfect orbit. It is drifting all the way down the pitch. If Muttiah Muralitharan romped and rattled, and shook a surface down for all the turn it was worth, Herath has spent time learning pitches and building trust. Eventually he and the clay are in collusion. Some balls grip to clip the bat or the stumps. Others skid on and rap the pad. There are days when he has tangoed happily with the rough for hours and hours, though also other times when nothing he tries - not the ripper, not the floater, not the roundarm darter - comes good. His is a gentle manner of working. But that is not to say it always gets gentle results. Between 2007 and 2014, Sri Lanka played in five major tournament finals, succeeding only in the most recent of them. Another way to put this: Sri Lanka failed to win a global title this century until, at last, they had Herath playing in a final. If this seems too generous, consider his record in marquee matches. In the 2012 World T20, Herath played only two of Sri Lanka's first five games but took two key wickets in successive balls to seal the semi-final, and claimed the game's best figures of 3 for 25 all up. He was dropped for the final. Why, you wonder? It is also a mystery to him. Just 16 months earlier he had taken a wicket and returned the most miserly figures in the World Cup semi, against New Zealand. But for the final at the Wankhede, another spinner was flown in, and Herath missed out. Later there was his 4 for 20 in a tri-series final in Port-of-Spain. There was also a 3 for 36 in another one-day final in Adelaide. But only when he delivered perhaps the greatest T20 spell ever, did he really graduate from the fringes of Sri Lanka's big-tournament teams. Five for three in Chittagong: two more wickets than runs. Fans will rave about Aravinda's 66 at Eden Gardens in 1996, but these numbers by the boy from Waduwawa are no less worthy of enshrinement. They make a good pair too, Herath and his hero; both tenacious, both pint-sized, striking flint on metal, sending sparks through the dressing room, watching the fire spread. That spell is great fun, so of course worth reliving, but encased within it also are the themes of Herath's career. Doubted by selectors, this match against New Zealand was his first of that World T20. It being a virtual quarter-final, and with Sri Lanka having to defend 119, the stakes could hardly have been higher. And what vintage Herath modes of dismissal. His tight lines had Brendon McCullum pottering around the crease for four deliveries before the ball jived laughingly past him when he finally ran down the pitch. Ross Taylor looked like he might have trouble making contact if he was holding a hangar door instead of a bat, until eventually he and his front pad surrendered to a straighter ball. James Neesham was bowled by a delivery that connived its way through the gate. Luke Ronchi had his bat beaten and his back leg pinged. All through the innings, batsmen committed to more wrong lines than drunks at a karaoke, and to finish off there was the carrom ball Herath had devised on rainy days at school, playing tennis-ball cricket indoors. "I think I must have the worst carrom ball in international cricket now," he chuckles. Sure, but has any other carrom ball capped a heist quite as brazen as this? Or come in such a cataclysmic spell? "Actually, from a long time ago, he's someone who took responsibility in difficult situations," says Hathurusingha. "I remember at Moors in one match - in the semi-final of a premier tournament, the other team had about a 80-run lead in the first innings, and then had hit 190 for 1 or something. This stage, we had all given up. Rangana had a good lunch on day three and he comes out, takes the ball and suddenly starts taking wickets. He took five and wrapped their innings up." In Tests, Herath has not played against Zimbabwe, but since late 2011 he has bowled Sri Lanka to victory against every other team. There was a South African slump in Durban. England, New Zealand and West Indies were all put away in his beloved Galle. Pakistan were dismantled at the SSC (as well as elsewhere), and Bangladesh at Khettarama. The most thrilling of Sri Lanka's recent wins was the turnover of that 192-run first-innings deficit against India, but if it is Dinesh Chandimal's manic innings that is better remembered from that game, it is partly because Herath's stomach for a heist was already well established. In defence of 176, almost casually he took 7 for 48. Rohit Sharma's wicket from that spell is one of Herath's career favourites. Drifting into the batsman, pitching on middle and leg, the ball broke away to clip the top of off stump, with a surge off the surface that is a specialty of the Galle pitch. "He doesn't come across as arrogant, but he's a very good fighter," Hathurusingha says. "I saw that very early, and always said the chance for him to play alongside Murali is what Sri Lanka needed. When he wasn't getting chances, I tried to give him a little push." It was one of Hathurusingha's pushes, in the end, that spun his friend's career around. By 2009, Hathurusingha had joined Sri Lanka's coaching staff. In the same year Herath had, for the first time, begun to wonder if he'd ever play for Sri Lanka again. He had cast his gaze overseas. "That time Ranga came and said to me: 'Aiya, probably my time has passed. I'm going to go play in a league in England.' I said, 'That's not a bad idea, but keep your fitness up. You never know when you'll get a chance.' Then before a Test match against Pakistan, Murali got injured. Kumar Sangakkara was the captain at the time. He said: 'Who do you think we should get?' I said: 'Why not Ranga? He's in England… but if you want, I have his number.'" It fits that a serial optimism has been hardcoded within. Because how else could a man of his workaday method have become one of the nation's greatest match-winners? Herath was in Stoke-on-Trent, in Staffordshire, contending with two of his least favourite things in the world: green pitches and cold weather. He was moments from leaving for the gym - or so he insists - when he got the call. "Ranga, there's a Test in Galle," Sangakkara had said. "It's not tomorrow but the next day. Can you make it?" Herath needed no second invitation. The workout was happily abandoned. "It didn't even really occur to me that I had to travel about five hours to even get to the London airport," Herath says. "But I thought, 'I've given my word now, so I have to go.'" Six days later Pakistan began the fourth day of the Test with eight wickets in hand, requiring 97 runs to win. With Herath's first-over double strike, a collapse was set in motion. In match-winning figures of 4 for 15, a career blueprint was set. "When I was flying to Colombo, I thought, 'I'm over 30 now. There are other spinners. This could be my last chance.' I made up my mind to forget all the excuses - to forget the travel fatigue and the jet lag. I tried to focus on giving this chance my all." When 38-year-old Herath, owner of 332 Test wickets, thinks back now, he is proud of the demands he made of himself on that flight, because if in the past seven years he has proved anything to himself, it is that when pressure comes, wickets usually follow. There is no sense of sibling resentment when older brother Deepthi speaks of Herath being an "obedient child", possibly because he was one too, and in general this seems very much like a goody-two-shoes family. "I can't really remember him ever getting into arguments, whether playing cricket or anywhere," Deepthi says. "He has always been a silent, calm fellow. Did whatever the parents wanted. He is even better now. When people in the neighbourhood are having troubles, he will call and ask me to pass on some money - things like that." The brothers, who have the same round face and are of such similar height and rotundity as to make them indistinguishable from a distance, are men completely of their land. Waduwawa is in Sri Lanka's coconut-growing "triangle", so there is barely a view in the village from which half a dozen coconut trees cannot be seen. Also in abundance are rice paddies, banana trees, durians, rambutans, mangoes, mangosteens, spiky pineapple tops erupting from the soil, and Buddhism. Hard places, it is said, breed hard people. Waduwawa locals would not know much about that. Uncle Gamini - a wiry man with the soft-spoken, genial demeanour that is rampant in this village - has watched Herath grow up, and speaks so glowingly about everything that you wonder if compliments are his sole medium of communication. Did Rangana ever get up to any high jinks? "No, he was much too sensible to do sorts of things like that." Did he throw a tantrum, or at least sledge, even in a school match? "Apoi no. So patient he was - even as a child." But he does talk back when someone hassles him, doesn't he? "Well, when a person speaks to you like that, it is good that you also have an answer to give, isn't it?" One of Herath's most memorable "answers" was non-verbal, and came during the June Test at Lord's. Having flashed at a Steven Finn delivery, Herath looked up to see Finn lope at him to deploy a sweary sledge. Herath's response was to summon every molecule of anger from within, and channel it silently at Finn like an irate father who had come home to find his son drinking with friends on the verandah. It was Finn who eventually had to break the stare, to head back to his mark. In 2009, Herath was in Stoke-on-Trent in Staffordshire, moments from leaving for the gym when he got the call. "Ranga, there's a Test in Galle," Sangakkara said. "Can you make it?" This exchange was perfect, because although when Herath bowls he is the affable Waduwawa man, in his batting avatar he seems the perennially angry dad. He hacks, he slaps, he cuts, he reverse-whacks. When the top order has collapsed, that scowling short-arm pull against the quicks does not seem so much an act of defiance as a stadium-wide proclamation of his pissed-off state. Very occasionally, if the light and wind and time of day are just right, there may even be a faint glimmer of the Jayasuriya swagger, immediately after the ball is struck. "Well, one thing you know when you see Ranga going out to bat, is that he will play the sweep," Hathurusingha says. "I think he used to bat better than what he is doing now, when he was younger. One time, at Moors, we were 70 for 7 or something, in quite an important game, he went and hit an 80. You know, actually he was a bit of an allrounder for us, because also, his fielding was quite good as well in those days. He was very quick." Herath? Quick? Let us propose here that time has muddled Hathurusingha's memory, because Herath the fielder is a cult icon, and it seems unacceptable that he ever could have been other than what he presently is. Could there have been a time before the knee injuries, when his chases in the outfield did not seem like he was wading in molasses? Has there really been a Herath diving stop that didn't bring to mind the controlled collapse of a building in one of those inner-city demolitions? Herath himself, at least, has made peace with the limits of his athletic prowess. He is matter of fact when contemplating bowling exploits, but lights up when his fielding is brought up - self-deprecation coming so much easier to him than self-praise. "Hmmm… more than joking about my fielding, I think my team-mates enjoy it when I take a good catch," he says, grin as wide as the settee he is sat in. "I remember one especially in Khettarama in a Test, when Darren Bravo top-edged a ball. I was in the infield and I dived forward to catch it. I got totally mobbed." That effort, from late 2010, cannot be found on YouTube, but thankfully the grab to dismiss Matthew Wade in a 2012 ODI can. It is a classic. The ball is launched high into the air, when Herath, fielding a few metres in from the long-on boundary, does the backstroke on the Gabba's green-icing outfield, until at last gasp he throws the left hand up, and incredibly, clinches the cherry within it. "Well, I guess my team-mates do laugh about it a little," he says. "It's not that they don't joke - they do." 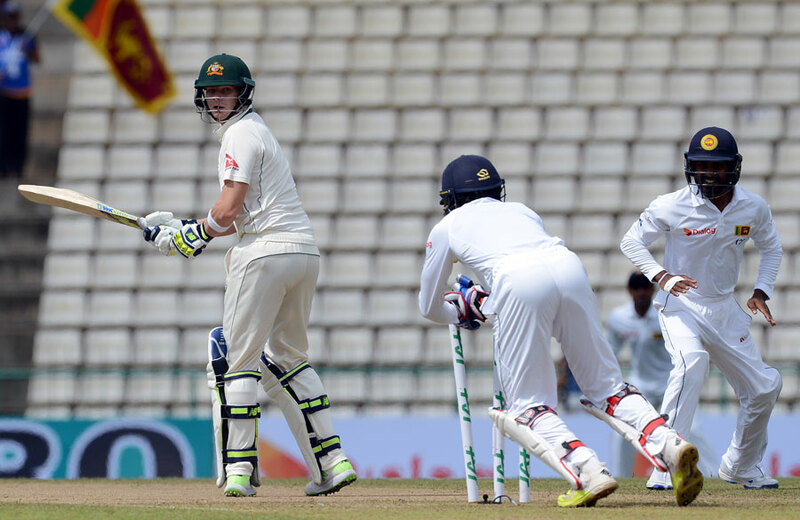 On July 30 in Pallekele, the first Test against Australia had stewed to a fifth day. The visitors needing a further 185, three down, and their two best batsmen at the crease, Herath's favourite seasonings had all been applied. All that remained, really, was for him to gobble the innings up. Could there have been a time before the knee injuries, when his chases in the outfield did not seem like he was wading in molasses? And it did seem inevitable. These are the days when there are games to be clinched, and history is crying out to be achieved, when Herath waddles determinedly to glory. These are the days when he beats batsmen in the air as well as off the pitch, when he makes diving saves around the bowling crease like he has been shot out of a cannon, when his belly does not seem so much a physical impediment as much as a vast personal store of cricketing fortitude. He had Adam Voges first, fourth over, the batsman thinking the return catch was a bump ball, and Herath easing into the day with a polite version of his already mild appeal. Warmed up, he was on his feet as usual for the next two wickets, backpedalling, arms extended - the big biplane caught in the breeze. The winning wicket closed a 17-year loop. Herath had made his debut in 1999, in the Test that immediately followed Sri Lanka's last victory against Australia. In spinning his team to a win against the one side that had so far held out, he also matched Murali and Shane Warne's record of seven five-wicket hauls in fourth innings. Eighteen days later, bowling upon wounded groin at the SSC, Herath took 7 for 64 in the last innings of the series, and went out clear on his own. But it was the spell from the first Test that resounded through the series, and had, in fact, been the second instalment of a two-part response to the selectors who had dropped him for the previous Pallekele Test, 14 months before. Sri Lanka had lost that match without Herath - Pakistan chasing a record 377 to win. It was upon his return, in Galle, that Herath had hijacked India's chase, then smilingly said at the press conference: "It's been happening to me throughout my career. Being dropped is nothing new." He was in good spirits when I saw him a few weeks after that match, at Sri Lanka Cricket's annual awards. Angelo Mathews had announced after that Galle win that Herath had been training hard to get trim. Standing before me in a black suit, a "Best Test Bowler" award under his arm, he seemed more streamlined than usual. "Congratulations Rangana aiya," I said. "You're looking good. How many kilos did you lose? Three? Four?" His smile vanished. He looked at me as if I was some kind of idiot. "You can't just lose weight like that, malli," he said. "I have lost about one kilo."